Cooper Farms donated nearly 210,000 pounds of meat in 2018. OAKWOOD – In 2018, Cooper Farms donated nearly 210,000 pounds of meat, helping to fulfill a need for protein at area food banks. The products, a variety of cooked, ready-to-cook and canned meat items, were donated to not only food banks but also for area events and organizations. Many of the donations provided were for benefits or fundraising events being held in the community. Because meat is the most expensive part of a meal, the donation allows the organizations to eliminate a big expense and raise more money for their cause. “We give financially through our Cooper Family Foundation, but as a meat company we can also provide food for events, organizations and community members. It is great to be a position where we can do this,” Cooper said. Some of the top recipients of donations included the West Ohio Foodbank, receiving more than 62,000 pounds; the CALL Food Pantry, receiving more than 28,000 pounds; and the Warrior Food Project, receiving nearly 20,000 pounds of donated protein. 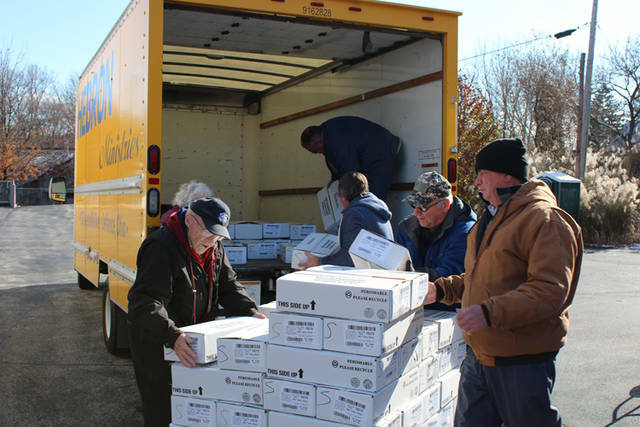 Defiance area churches received more than 13,000 pounds of meat in 2018.